LIMA, Peru, September 30, 2010 (ENS) – Nearly three months after Peru’s immigration department informed British educator and Catholic De La Salle brother Paul McAuley that his residency had been revoked, he remains active in the defense of the country’s rainforests and native peoples. Yet despite a court victory and support from local religious and indigenous leaders, various environmental organizations and Amnesty International, McAuley’s lawyer said that Peru’s Interior Ministry has not abandoned its efforts to deport him. “The state’s persecution of Brother Paul continues,” said attorney Rita Ruck, who represents the Catholic Church’s apostolic vicariate of Iquitos, the Amazon River port where McAuley lives. The Immigration Department cancelled McAuley residency in late June on the grounds that he had engaged in politics and activities that threatened the public order. When the Catholic Church’s lawyers appealed the decision, however, the Interior Ministry failed to prove that McAuley had violated immigration law and a judge halted his expulsion. Ruck explained that since then, local immigration officials have simply refused to renew McAuley’s residency card, which expired on September 21. She said that most of the Catholic clergy in Iquitos are foreigners who renew their residency every year, a process that usually takes a few hours. “They’ve come up with a hundred excuses not to renew Brother Paul’s residency,” she said. Born in Portsmouth, England and educated at Oxford, McAuley taught in rural Nigeria and ran teacher trainings in Rome before moving to Peru in 1990. He helped build and run a school in a shantytown in the desert north of Lima before moving to Iquitos, in Peru’s lush northeastern lowlands, in 2000. McAuley explained that his education work in Iquitos included trips to indigenous communities scattered through the surrounding rainforest, where he witnessed the impact of logging and oil exploitation on the region’s natural resources and native peoples. During the past decade, Peru’s government has facilitated an expansion of oil exploration and logging in the country’s portion of the Amazon Basin – the second largest slice of that vast wilderness after Brazil’s – more than half of which has been divided into oil concessions. In 2005, McAuley and several former students founded the Red Ambiental Loretano, or Loreto Environmental Network, to educate the region’s indigenous inhabitants about threats to their forests, rivers and livelihoods. Though its focus is environmental education, the organization presented a legal motion that forced the government to release the results of a Ministry of Health study documenting high levels of lead and cadmium in the blood of Indians living along the Corrientes River, into which oil companies dumped contaminated production waters for years. 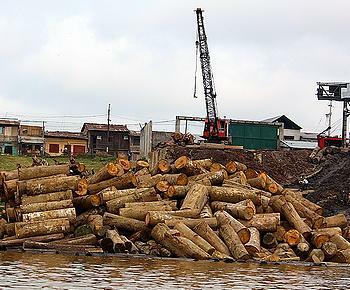 Another legal case filed by the organization resulted in a ban on logging in the Mazan River Basin, which loggers have since defied. McAuley said he believes the attempt to deport him stems from his recent efforts to educate local people about the forestry law currently being debated in the Peruvian congress, which he claims would allow the concentration of vast tracts of rain forest in few hands, among other problems. The administration of President Alan Garcia drafted the law to replace one that was repealed last year following a 10-week indigenous mobilization against nine laws that native leaders said threatened their land rights and natural resources. That largely peaceful protest turned violent when police stormed a highway blockade in Bagua province, launching two days of bloodshed that left 200 injured and 34 dead. President Garcia insisted that the laws posed no threat to the Amazon’s native peoples and claimed that their leaders had been deceived by outside agitators. Garcia’s Chief of Staff, Javier Velasquez, called McAuley an agitator when reporters asked him about the case in July. 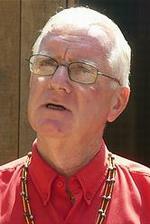 McAuley explained that his environmental work grew out of his religious vocation and cited a declaration of the Latin American Bishops Conference that calls upon members of the Catholic Church to help communities that are threatened by the destruction of the natural resources they depend on. McAuley is one of several Catholic priests and bishops who have been threatened with deportation because of their work on behalf of the environment, or indigenous communities. Five leaders of Peru’s principal Amazonian indigenous organization, the Peruvian Rainforest Inter-Ethnic Development Association, AIDESEP, are also fighting charges of fomenting sedition and riots filed during the last year’s protest. Ruck said she believes Peru’s Interior Ministry is working on a second case against McAuley, who received a summons last week. She explained that the summons was a violation of due process, since he hasn’t been charged with anything, so she responded by filing another writ of habeas corpus. Two indigenous groups have offered McAuley sanctuary in their territories to save him from deportation, but he said he wouldn’t consider accepting their offers.